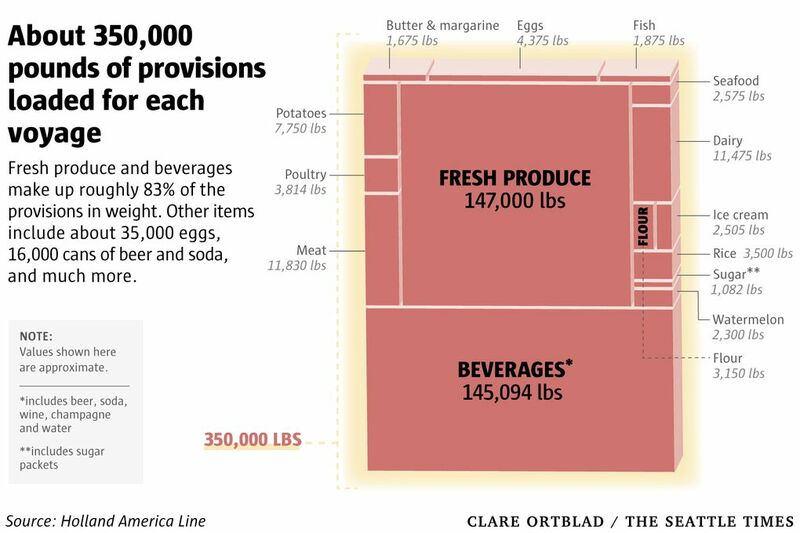 It may be a leisurely 7-day vacation cruise for passengers, but for the staff it begins with a race to load 147,500 pounds of fresh produce, 35,000 eggs and more, while cleaning hundreds of rooms and properly delivering 8,000 pieces of luggage. It’s 5:45 a.m., and Elliott Bay is quiet as the first glimpse of morning light greets the arrival of the Eurodam, the biggest cruise ship Holland America Line sails out of Seattle. It pulls into Smith Cove like a floating skyscraper, dwarfing the longshoremen who stand ready to tie it off to Pier 91. Inside the 936-foot-long vessel, there’s a whirl of activity on the third of the ship’s 14 levels. 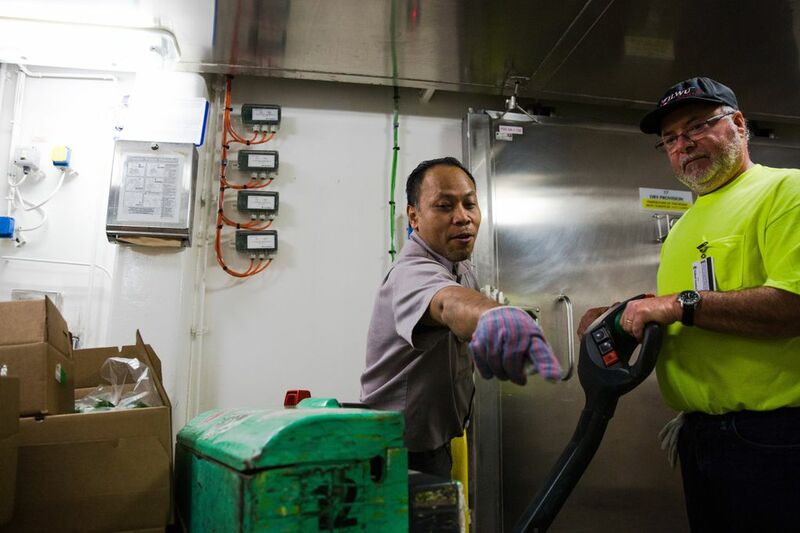 Provisioning master Herman Hermawan and his team are cleaning the passageways and tidying bare storerooms in preparation to take on about 350,000 pounds of food, beverages and supplies. 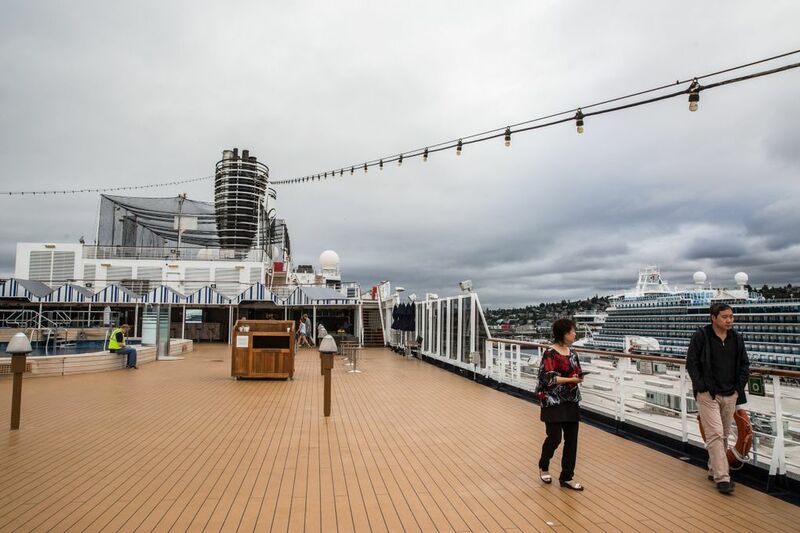 For the more than 2,100 guests aboard, it’s the end of a seven-day journey that includes several stops in Alaska, a sail into Glacier Bay and a stop in Victoria, B.C. But for Eurodam’s 856 crew members, it brings the busiest few hours of the week. “For hotel staff, turnaround is a heck of a day,” Hermawan said. 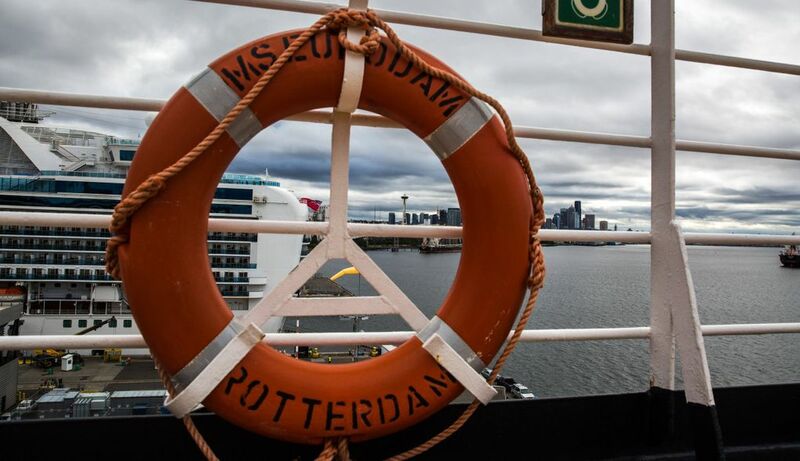 The ship is scheduled to depart at 4 p.m. Eurodam’s hotel crew has four hours to clean and sanitize 1,052 staterooms, and less than nine hours to transfer more than 8,000 pieces of luggage and load some 350 pallets of provisions for another weeklong journey. Coming aboard will be 147,500 pounds of fresh produce, 35,000 eggs, 1,375 gallons of milk and 16,800 cans of beer and soda, just to name a few items. At 7 a.m., a crew of longshoremen swings large containers dangling from dockside cranes toward two massive doors in the side of the ship, just above the waterline. Inside, more than 4,000 pieces of luggage await. Housekeeping staff collected those bags from the ship’s hallways the night before and packed them into 63 large gray bins, each labeled with a color-coded tag corresponding to the guest’s assigned time to disembark. Hermawan, 46, watches from an inside corridor as the longshoremen use pallet jacks on the ship to slide the bins into the empty containers hanging off the ship’s side. Hermawan, from West Java in Indonesia, is a 25-year veteran of the cruise industry, beginning as an entry-level assistant and working his way up to provisioning master in 2012. Like the rest of the hospitality crew, he works 10-hour shifts or longer, seven days a week, for his six-month contract. 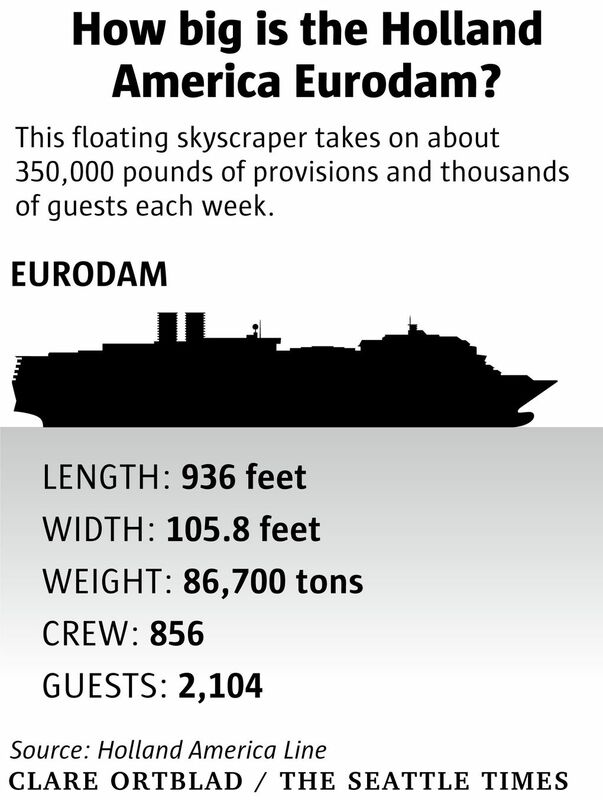 (As a foreign-flagged ship, the Eurodam is not subject to U.S. or Seattle labor regulations.) Other crew members work as long as nine months. There’s not enough time to visit Seattle on turnaround days, but he takes advantage of opportunities to shop in Juneau or get some fresh air in other port cities. When his contract is over, Hermawan travels back to Indonesia to spend one or two months with his wife and two young sons before returning for another tour at sea. In 45 minutes, the luggage has all been cleared, and forklifts begin scooping up pallets of supplies staged under a large white tent on the dock. He holds a radio in one hand to communicate with his crew and a cordless phone in the other to stay in contact with the rest of the ship. The phone rings consistently with calls from staff who are waiting for supplies to arrive. The sound of pallet jacks rolling over the ship’s studded metal floors is deafening, as Hermawan tirelessly paces the passageways, directing longshoremen with hand motions like airport workers guiding planes to their gates. 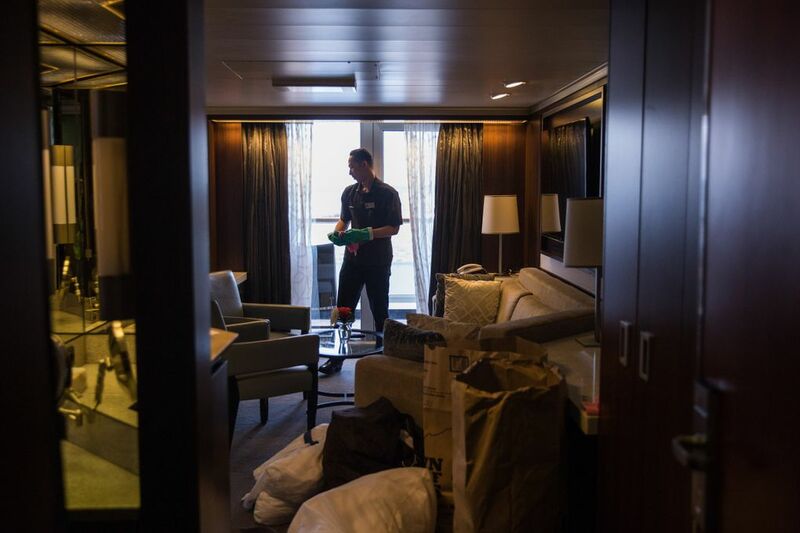 Up on deck seven, executive assistant housekeeper Ruben Pereira walks the quiet halls, overseeing the cleaning of staterooms. While the ship’s housekeeping staff is primarily from Indonesia and the Philippines, many supervisors, including Pereira, are from India. 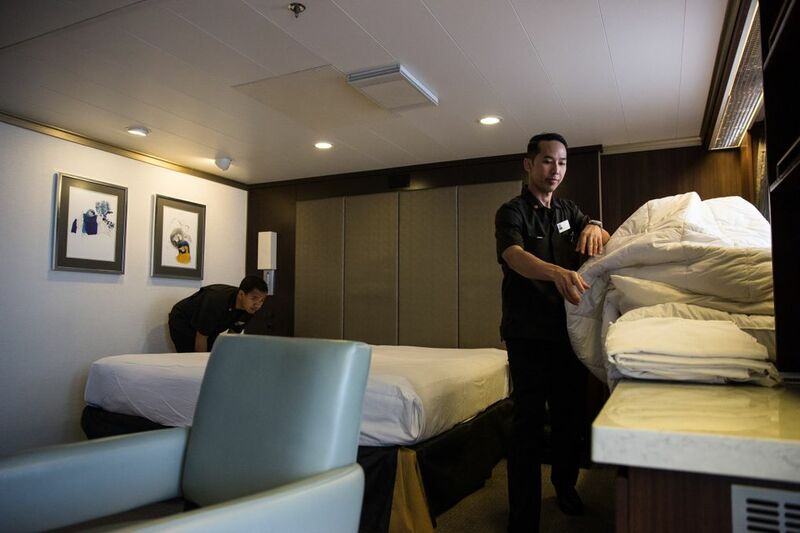 The housekeeping staff divides into teams of three on turnaround day, each team responsible for 30 cabins. They begin cleaning at 7:30 a.m., as soon as the first guests disembark. Because Holland sends guests directly to their cabins when they board, all 1,052 rooms must be cleaned and sanitized before the first guests arrive at 11:30. “We plan for it to take on average only 20 minutes per room because we have only four hours,” Pereira said. As Pereira looks on, a lead steward and his assistant begin stripping the bed in a suite. The dirty laundry is sorted into different colored bags — white for linens, brown for bathrobes and blue for towels — to make the wash go faster. More than 500 bags will eventually make their way to the laundry room to be cleaned later in the day. The team then pulls a “stateroom pack,” containing all the supplies needed to restock the room, from a drawer under the bed, where it had been placed the previous evening. A third member of the team hurries in and begins to clean the bathroom. “He only does the dirty jobs,” Pereira says, both to expedite the cleaning process and to avoid any cross-contamination with the rest of the room. Due to sanitation issues and so many people in such close quarters, cruise ships have become infamous for norovirus outbreaks that seem to erupt every year. Holland’s Zaandam experienced an outbreak in June, on a voyage from Seattle to Alaska, that sickened 73 people. The trend is not encouraging. In 2017, cruise lines had the highest failure rate of sanitation inspections since the Centers for Disease Control and Prevention (CDC) started inspecting vessels in 1990. The Eurodam, however, has scored 100 percent on its last 13 inspections, according to the CDC website. Just as the lead steward finishes the suite by wiping down its surfaces with a cloth soaked in disinfectant, a dining-staff employee comes into the room to fill a bucket with ice to chill the Champagne bottle delivered earlier. It’s 9:45, and the team must move quickly. They still have 17 rooms to go before the guests begin boarding in less than two hours. By 11, provision pallets are backing up at the ship’s freight elevators. Hermawan bounces back and forth, operating both lifts while continuing to guide longshoremen to the proper areas. 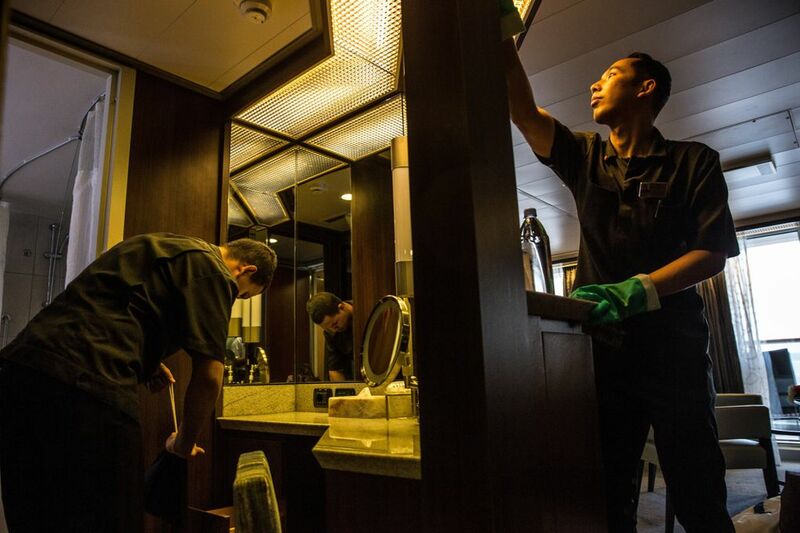 Along the passageway, in nearby kitchens next to the storerooms, culinary staff are chopping fruit, baking bread and prepping for the day’s scheduled lunch service, the first meal for the ship’s new guests. Cooks and dining staff, pushing trolleys for the restaurants upstairs, merge into the traffic of longshoremen and pallet jacks barreling through the corridor. The strain of turnaround day is beginning to show on Hermawan’s face as he juggles the phone, the radio and the traffic around him. “I never go the gym, so this is my way of staying in shape,” he later jokes. The pier is bustling with activity by noon, with ride shares, taxis and tour buses dropping off passengers eager to get aboard. Terminal 91 processes more than 10,000 travelers every Saturday during cruise season, and nearly 40,000 every week. 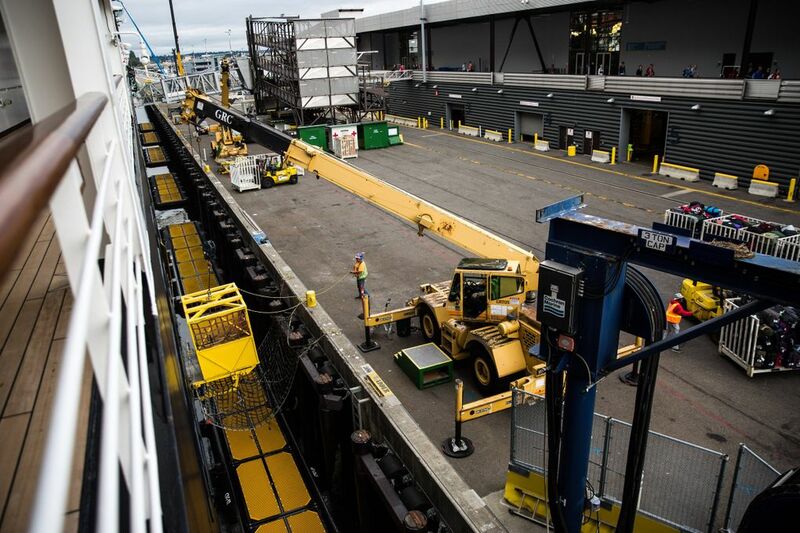 The Port of Seattle said it expects to have about 216 cruise-ship calls this season, with more than 1 million passengers flowing through the cruise terminals. The cruise industry provides more than 4,000 local jobs and contributes $501 million to the local economy, according to the Port’s 2017 economic-impact data. “You talk to cabdrivers, hotels and restaurants in the area, and people light up when you mention the cruise season,” said port spokesman Peter McGraw. 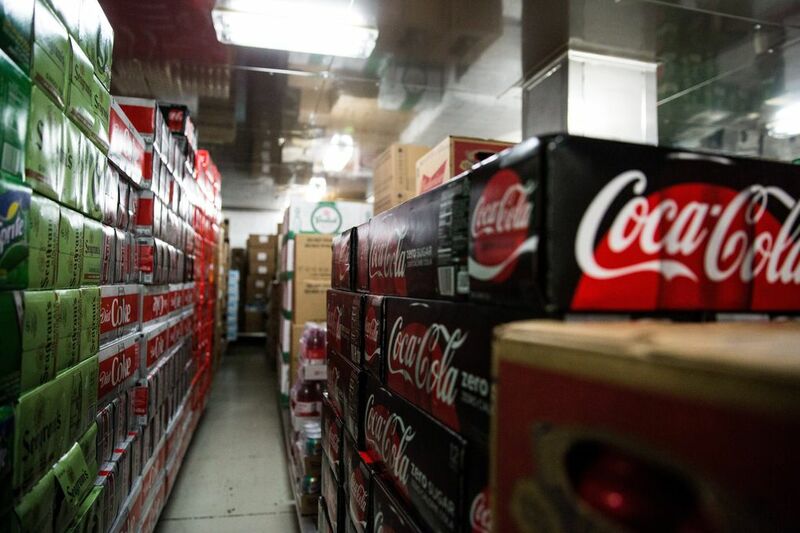 Holland, which is headquartered in Seattle and has four ships that visit the city, said it works with nearly 700 Washington vendors and spends an average of $300,000 on provisions each turnaround day. It’s 1 p.m., and thousands of people are flowing through Terminal 91, dropping their luggage with porters before making their way through security. Retirees, families and couples of all ages make their way toward the Eurodam’s gangway, some stopping to pose in front of a green screen for photos that will later be superimposed on an image of a giant glacier. 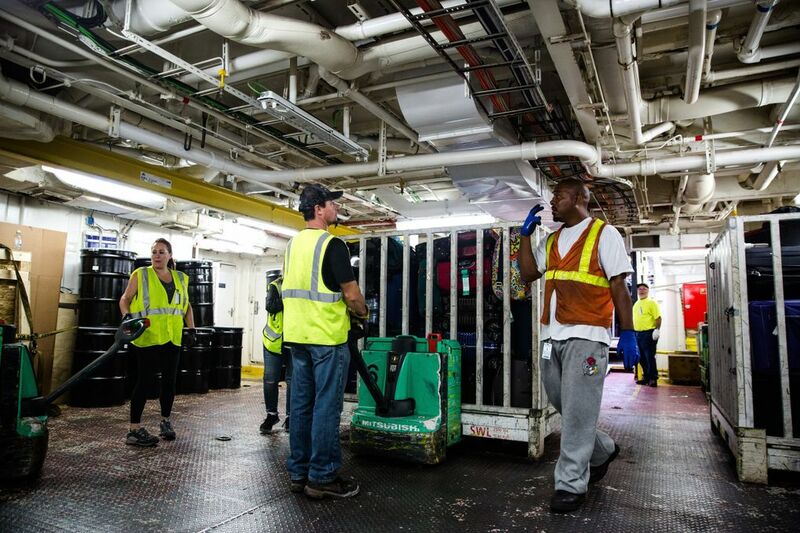 The last provision pallet is loaded by 2 p.m. and the longshoremen work to finish with the luggage bins, filled with the bags of arriving guests. Inside the ship, dozens of housekeeping staff in all-black uniforms pile the bags onto hand dollies for delivery to the proper staterooms. By 3:15 p.m., everyone is onboard and accounted for, the last luggage bin is being loaded, and a series of high-pitch tones over the ship’s intercom indicate the start of a mandatory emergency drill. After that, guests can join in a sail-away party on the aft deck, featuring Northwest cheese, wine and beer. But Hermawan is still busy in the lower decks, breaking down pallets and arranging provisions. As sailors close the loading doors, longshoremen prepare to release the ropes that secure the ship to Pier 91. Eurodam pulls out five minutes ahead of schedule, with a series of loud horn blasts. As it ventures into Elliot Bay on its way to Juneau, it takes the hustle and bustle of turnaround day with it, and silence returns to Smith Cove until the next ship arrives.